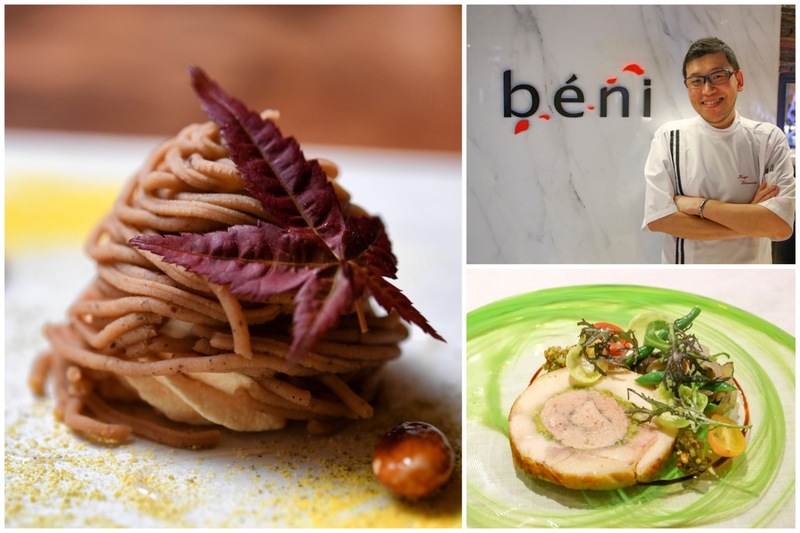 [Updated June 2017] Beni is awarded 1 Michelin Star in the Singapore Michelin Guide 2017 and 2016. Beni was a birthday treat from a friend. Glad we picked it, because the food was top-notch. Dining here was like watching a piece of quiet culinary art. 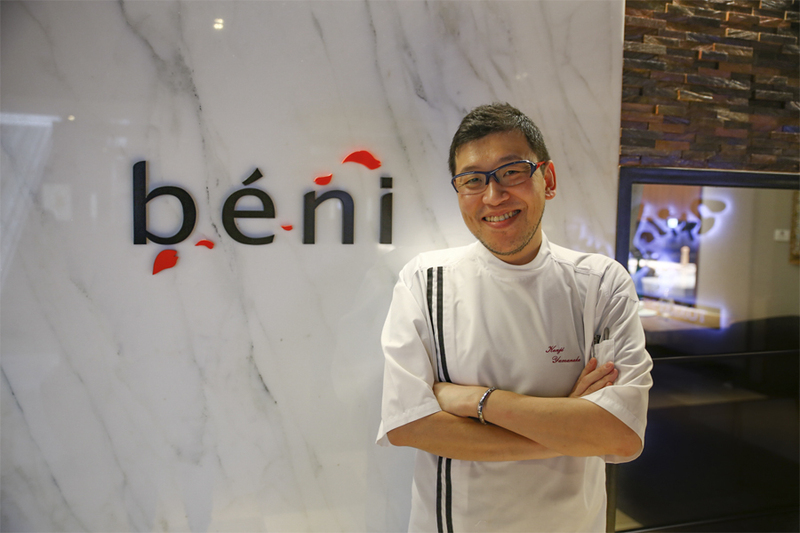 The word “Beni” means “blessings” in French, “red” in Japanese, with the objective of being a restaurant “where every meal is a blessing”. 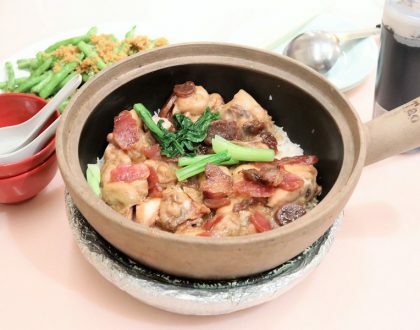 It won a Michelin Star in 2016, but closed for a couple of months for renovations, and moved to Level 2 of Mandarin Gallery. 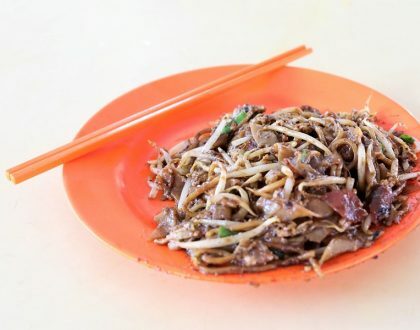 Singapore Michelin starred restaurants I have yet to try. 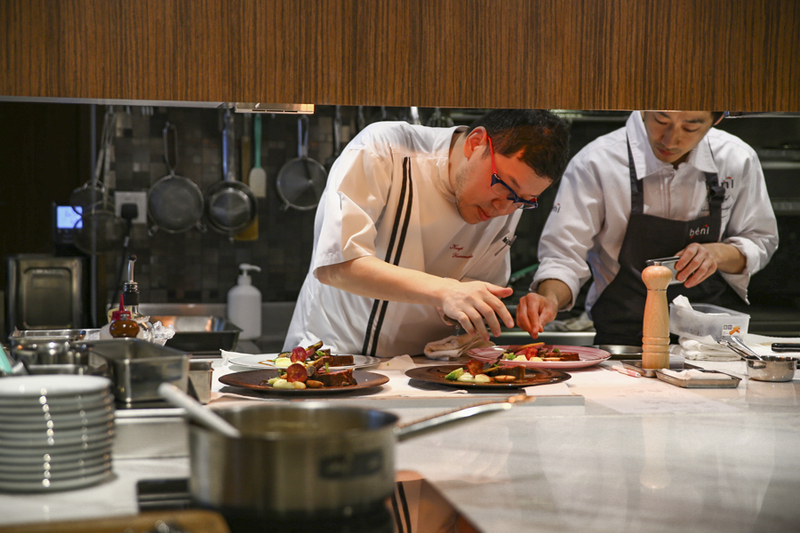 Chef de Cuisine Chef Kenji Yamanaka helmed his skills in multi-Michelin-starred restaurants in France (Georges Blanc Parc & Spa) and Japan (L’Osier), and currently serves up French fine dining cuisine using Japanese produce. That includes an Ozaki A5 Wagyu Beef from Miyazaki prefecture. 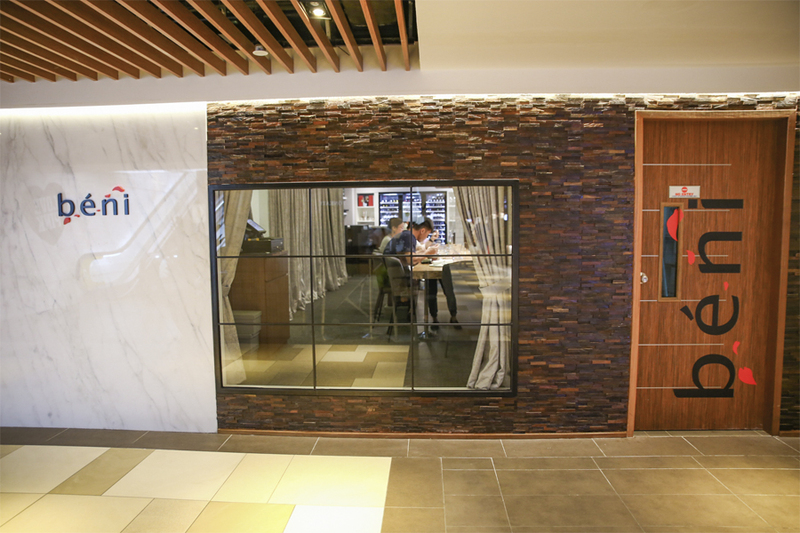 Take a seat by the counter, though there are two VIP rooms available. 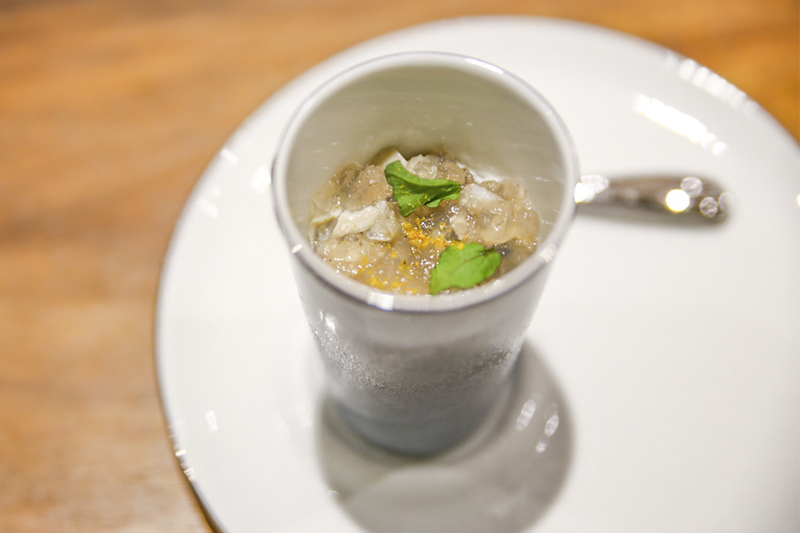 This is where you can get a Chef’s Table Experience. Watching him and his team work was a testimonial of amazing teamwork and chemistry. They are about a metre away from us diners, preparing for service with minimal talking verbally. There were slips of paper being passed, but that was infrequent. Just eye contact, a nod, a slight push of the hand, nothing too intrusive. It was quiet, but wasn’t intimidating at all. Everyone was just very focused in their task. Such a pleasure to watch. 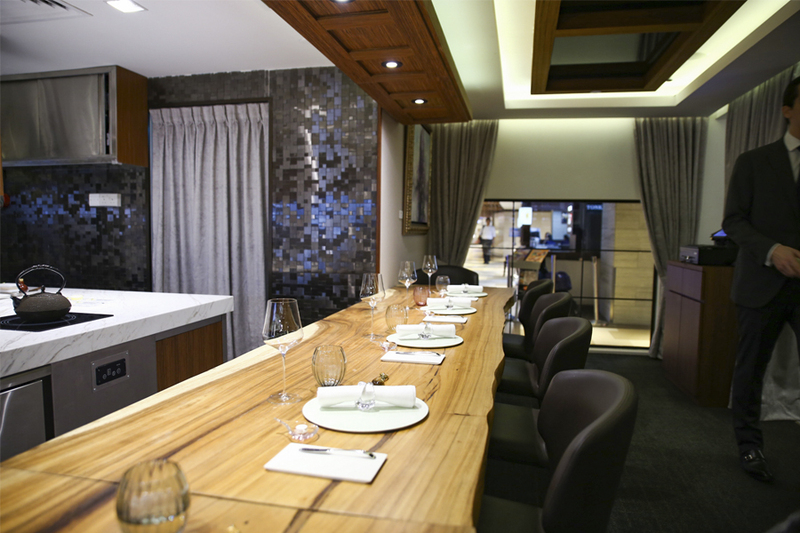 The finishing stages of the food preparation are done in full view of the patrons due to the open concept. The staff to patron ratio is also very low. With 6 staff members, even if fully booked, the ratio is still almost 1:3. Hence, one can expect a personal level of service to be provided at Beni. Lunch menus are at 88++ and 228++ for five courses on weekdays and 128++ for seven courses on Saturdays. Dinner menu is at 258++ for 8 courses. Some of the signatures include Roasted Fish of the Fay from Sea of Japan with parsley in caul fat, sautéed chicory, lemon flavoured fish essence; and the roasted New Zealand Venison with charcoal bread crumbs blackcurrant mustard, hazelnut puree, grand veneur sauce. 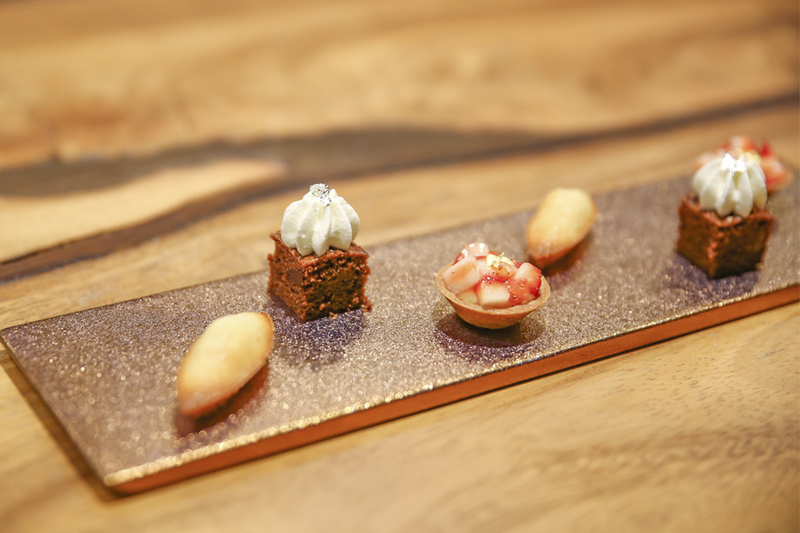 This was one of the unusual meals where I got impressed already with the bread servings. (The other place was Joël Robuchon Restaurant. 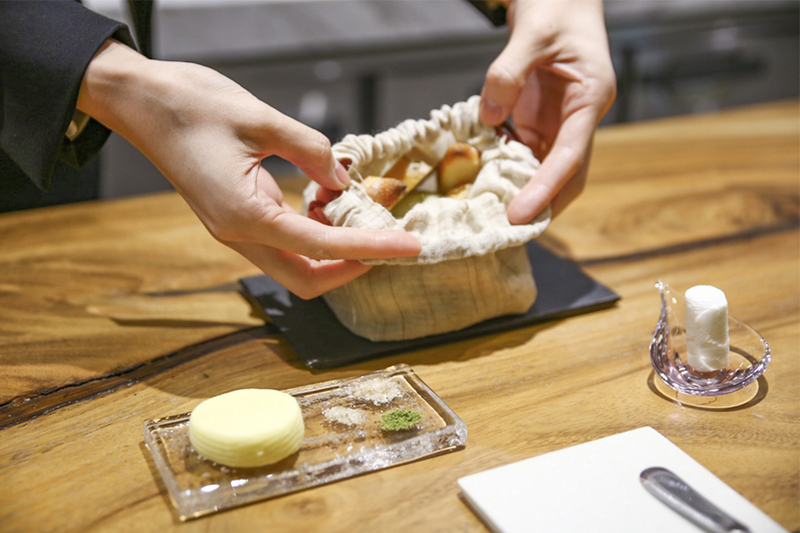 The breads were served in a sack-like bag, with a surprise at the bottom – heated pebbles to keep the mini-baguette and Japanese seaweed bread warm. The Normandy salted butter was brilliant. I could never quite like oysters and watercress in the same way as other food. But somehow when these two are put together, there was so much freshness and excitement in the mouth, like the sea creatures were having a waltz within. The Chicken and Foie Gras looked unassuming, but you do wonder how chicken breast and goose liver work in synergy together. 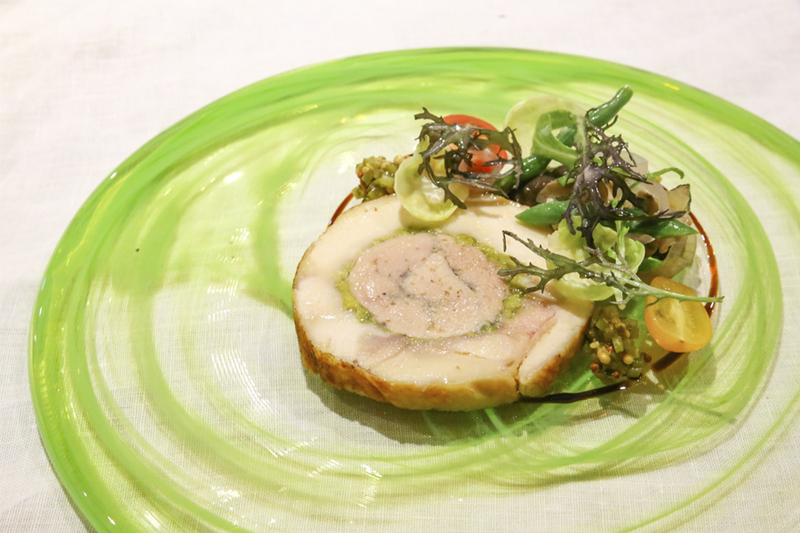 The poached terrine consisted of an outer layer of leaner free-range French chicken, with buttery foie gras within. Lovely contrast of textures, yet harmonising in taste. I am usually sceptical about Monkfish, because not many restaurants prepare them well, and they can end up being too tough. 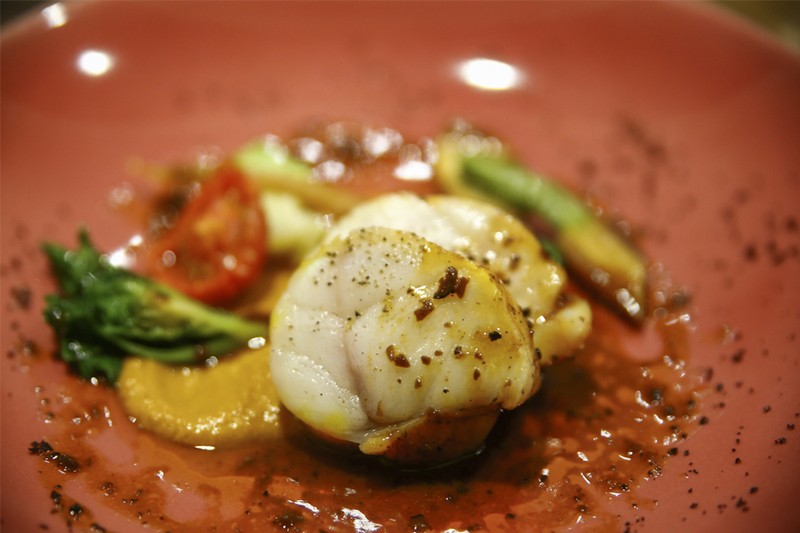 This dish was brilliant, with Monkfish cooked in a style called “happiness” – wrapped in a pig’s stomach, pan-seared in the oven, then braised, seasoned with paprika and saffron. 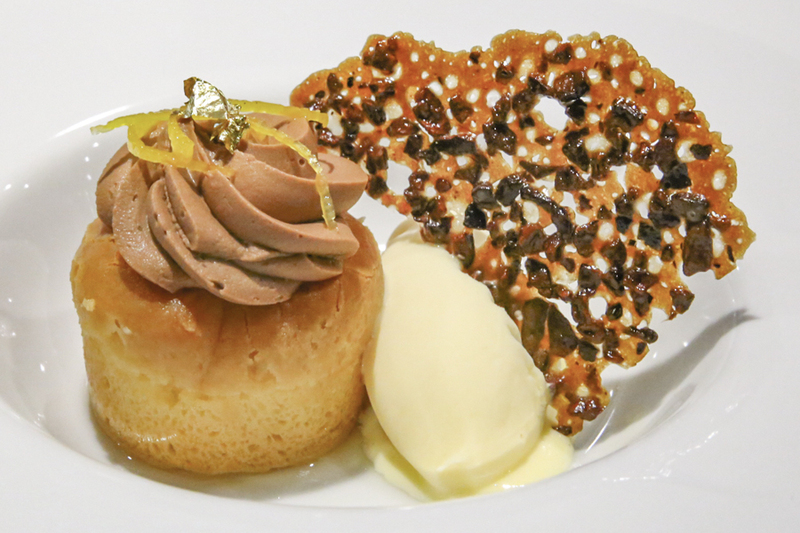 Dessert was the “Baba”, like a mini-sponge cake, infused with Japanese Hibiki whiskey, topped with chocolate Chantilly, with a scoop of yuzu ice cream. Another surprise comes when it is cut through, revealing custard cream in the centre. The cake was alcoholically-wet. 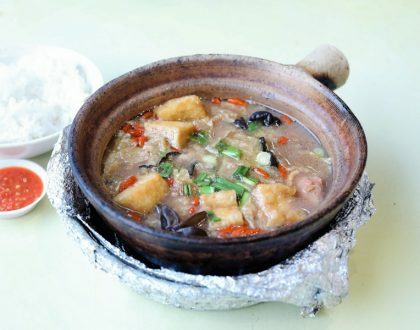 Food at Beni is generally of high quality using fresh ingredients, but note that portions can be small. Even though it won a Michelin star, I find it quite an understated restaurant, often being off-the-radar. Such a blessing to have a meal here.